26.2 Quest: Black Toenail Polish? I have never wore black toenail polish before and I don't plan on wearing it anytime soon just for the record. 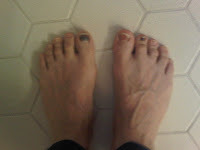 Another thing I have never had before was black toenails from running. I have run a marathon, multiple half marathons, and many other small races and I don't ever recall having a black toenail or losing one. I did come close at one time with a toenail that looked a little off but it eventually grew out, but never fell off. This recent marathon was a different story. I have ended up with three black toenails, one of which I am sure will eventually fall off. I am not sure why this is the case because I ran in the same shoes (OK, same model) as I did in the first marathon, and many of my other longer races. I took a picture because everyone loves a good picture of feet.... even though my wife says I have ugly feet. Another first for this marathon was a lack of chafing. I have had issues with chafing in all of my longer races, as well as in many of my long runs, but I came home from this recent marathon without any issues at all. I am sure part of this can be attributed to the cooler weather, however I have chaffed in cooler weather before. 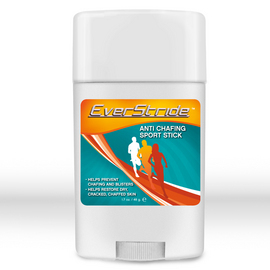 The big thing I did differently was I used the Anti Chafing Sport Stick from Everstride. I have used other brands that are similar to Everstride in the past and still do on occasion. Everstride contacted me recently and wanted me to give some of their products a try. I had used the Sport Stick a few times leading up to the marathon and was confident that it would treat me right on race day. They also sent me some of their Pro Therapy Foot Treatment, and their Fungus Rx Defense. I have not personally had any issues with blisters with my feet since all the walking I was doing over the summer, but my daughter has been trying to transition to a new pair of custom orthotics and has been having a lot of trouble with blisters. She has been using the Pro Therapy Foot Treatment for this issue. It has been helping, but we think we have bigger issues and the blisters keep coming back. The Fungus Rx Defense I have not yet had an opportunity or reason to try so I cannot offer an opinion on it. If I ever do have an opportunity or reason to do so I will let you know what I think of it. 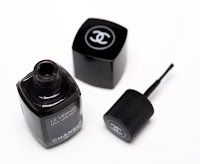 Do you have trouble with black toenails from longer runs or races? What do you do about them, do you just let them fall off or do you try to hurry the process up? Tim, great blog btw. Just lost my left big toenail yesterday. It went black after a 12 hr ultra on 7/30, and it gradually became brittle. It took 5 months for it to fall off in due course, and the undernail or whatever you call it is coming in as nature intended. Just let it happen. Could have avoided it by simply keeping my nails trimmed short. David, Thanks for the kind words. Congrats on your ultra! That is what I am expecting to happen to three of my toenails this time. I even thought I had trimmed them enough too. I am just hoping that it happens before my next marathon is all. I am having a toenail issue at the moment. Did an 8km yesterday and the downhill bit really brought on some pain. It fell off a couple weeks ago - the regrowth is not pretty. I am am just hoping it will be ok for my next race on Jan. 23 - half-marathon.